Hello all, back from hibernation, still been playing the game, but wasn’t doing anything internet wise. I love to make maps in Last Winter, of the game world around my character. 9 characters, 10 including me. I’ve seen bear, fox, bird, coyote, lynx, deer, porcupine, skunk, raccoon, and moose. If you wanted to see a map, how would you like to see it? In my previous mapmaking the colors have said to be a bit strong, the map-key a bit long or difficult. I am thinking about finding a better sound for videos and make some short tutorial videos. Since my map is large and I have existed for a while … I will focus less on survival and more on doing actions. In the meantime (while I lack such a sound device) I am wondering how to show you the world my character is in. Well … I’ll edit this thread up a bit. All mute on the map stuff, so I will try to add in some screenshots or tutorial stuff on LW. Going to see what day winter will be is I guess … each season may be 30 days … maybe we don’t start on the first day of the season? This reply was modified 1 year, 3 months ago by LWillter. Anyways who … this video is showing how effective trapping can be. I made a point to hardly do anything else but show the traps. Sorry there is no audio … seems that was another mistake as well. Anyways, I have over 100+ traps on my map and this shows about half of them. I high encourage anyone playing for the long game to place traps. Definitely … I think you also suggested this in the suggestion forums … but a question about that … what would be their purpose? Would they be going somewhere or be random paths? They will be enviromental hazards that you have to go through, using special equipment. They would lead nowhere, because the government didn’t have enough money to build actual towns. Understand completely on how big they are. In North Carolina where I live … walking in the old roads can have the sides can be from your ankles to your shoulders (in some parts they just cut through it) Even now with trees growing in the road you can clearly see where the road was. Can you share a picture or a link of the kind of road you’d like? I seem to only see modern road pictures on google. Has anyone ever seen an island in Last Winter? I was thinking about pirates seeing maharabal’s picture/persona and I thought wait … I have seen rivers make corners, I have walked in between rivers on both sides … but I don’t believe I have ever been surrounded by rivers. To make this island four lakes would have to touch, the southernmost lake top would be in between two other lakes, with the northern lake bottom directly the southernmost lake top. That would be extraordinarily rare. Talking of this rarity, less make a less rare one that I haven’t run across. Has anyone been on a peninsula? With beaches on 3 sides? Dumping this GOLD here for reference on the “old” LW game. Now to use a bit distant relation Quebec is ~1,193 km from Newfoundland which I am going to use as an approximate for the ocean. It seems anything east of Quebec river wise should gradually get bigger, forming a gulf and then finally a river. Walking in the game, I have walked over 1,193km in the game; so it is feasible to walk that far. Do you think an ocean or gulf would be a nice addition to the game? Do you think it is feasible? On a scale from 1-10 … 1 being utmost importance and 10 being ‘Let’s not do that’ how do you feel about an ocean, gulf, large body of water being added? By the way is it possible to canoe in the Gulf of the St Lawrence? 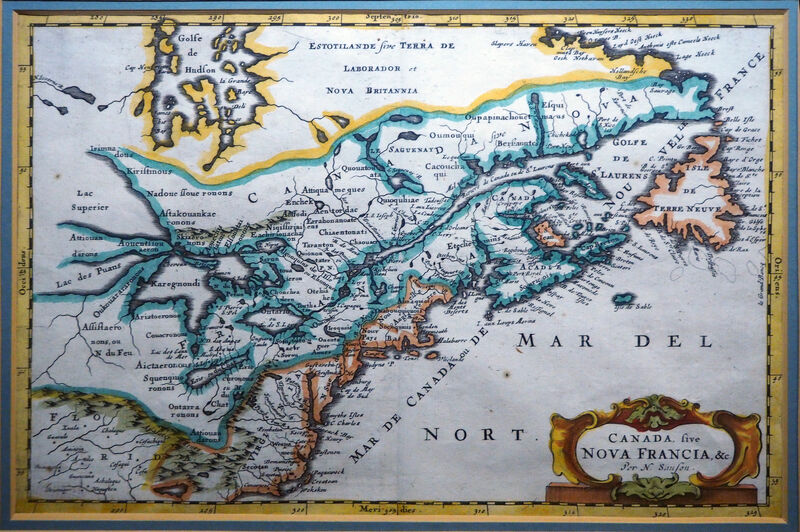 Based on maps of North America at the time of the game (1650’s), important bodies of water such the Eastern Great Lakes should be modeled eventually, along with the St. Lawrence (already in the game). Perhaps from Quebec, you can hitch a ride to Newfoundland or Acadia on Nova Scotia. But is Newfoundland or Acadia on Nova Scotia not the opposite direction of where we want to go since we are illegal/ independent fur traders by nature and in those directions there is more civilization then wilderness. The great lakes would be nice but I am not sure if we should be allowed to cross a large body of water. For me we could stay north of the St.Laurence and the great lakes making them natural game boundaries. If we go to far to the west (past lake superior) then perhaps we automatically get lost in the sense that the game gives us wrong coordinates and thus sends us back. Kind of like getting lost but with the automatic mechanic to backtrack back into New-France. On the other hand, reaching the Pacific Ocean would be cool. Maybe even venture all the way up to Alaska. South into what is now the USA should not be possible due to the change of climate and conditions for our intention of being there. I just used Newfoundland as an estimate for how far the ocean is from Quebec … I tried Quebec from Ocean and it gave me some point in between Africa and South America. I am unsure of what was there was back then, but I think a good solid border would just west of the Great lakes. Watched a timelapse video and for almost 40 years ~1627-1664 there was no expansion in the Western parts. Also it seems during the game’s timeframe Newfoundland is not owned completely .. French claim the west the English claim the eastern part, and none in the middle. One difficulty I see in making an accurate map is angles … right now in Last Winter the St Lawrence river is a flat horizontal river E-W river while in reality it goes N-S at about a 60 degree angle or so. As for Alaska … That is a long journey … almost 7,000 km! I will see if I can find known settlements or forts during this time, who they belonged to and see who is on the outskirts. It seems Texas is much closer than Alaska, and I remember at some point I was looking for the Spanish, so can definitely see the desire. Since we are heading into LW2 at full speed I though I could post a real, or better, historical 1650s map here.